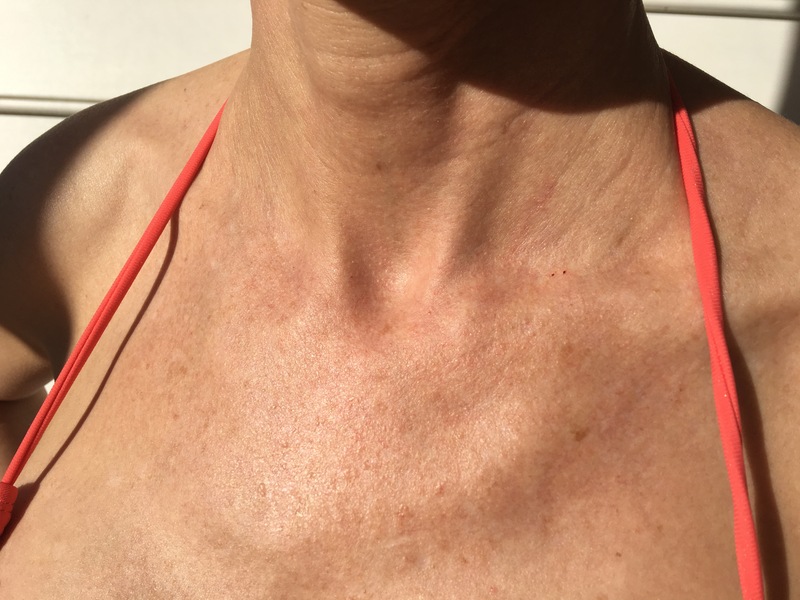 I recently posted a lengthy article on the evidence supporting supplementation with hydrolyzed collagen + hyaluronic acid (HA) + Vitamin C – a combo of supplements that when taken together have been proven to reduce skin wrinkling, improve skin elasticity and increase skin’s overall hydration (think plumping) levels. You can check out that post here. The basic idea is that several studies have proven that consumption of a hydrolyzed collagen powder in conjunction with daily hyaluronic acid and Vitamin C supplementation can significantly increase your skin’s hydration levels, improve its elasticity and decrease wrinkles. Pretty exciting stuff! Check that post for full research detail and product recommendations. There are a number of quality hydrolyzed collagen products available nowadays. 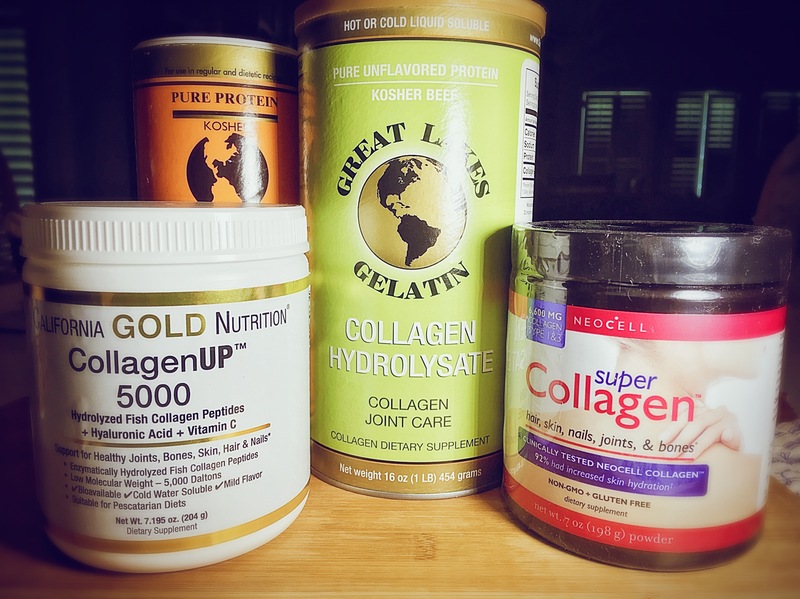 The 3 I like best are California Gold Nutrition CollagenUp; NeoCell’s Super Collagen; and Great Lakes Gelatin brand Collagen Hydrolysate Kosher Unflavored Beef powder. Great Lakes Gelatin brand also produces 2 other collagen supplement options – these awesome Collagen Hydrolysate Convenience Packs and these nifty little Collagen Endurance Plus packets. The latter product includes 100% of RDA for all B Vitamins as well as 100mg. of Vitamin C per serving (packet). However, the Collagen Endurance Plus products do have some added sucrose, so this option would not be appropriate for folks actively doing #WHOLE30. The following recipes combine hydrolyzed collagen and other superfood ingredients into enjoyable, yummy-tasting beverages. I try to drink 2-3 collagen beverages per day. Experiment with these recipes and let me know (in the comments) if you have other collagen recipes you love! I’ve written previously about green tea and the evidence supporting its status as a superfood. I was recently alerted to this fantastic, and quite compelling article detailing the 15 health benefits of green tea and the science behind them. So if you (like me) enjoy geeking out on the science of nutraceuticals and health foods, be sure to check it out! This recipe is really tasty and helps ensure I meet my daily green tea quota. 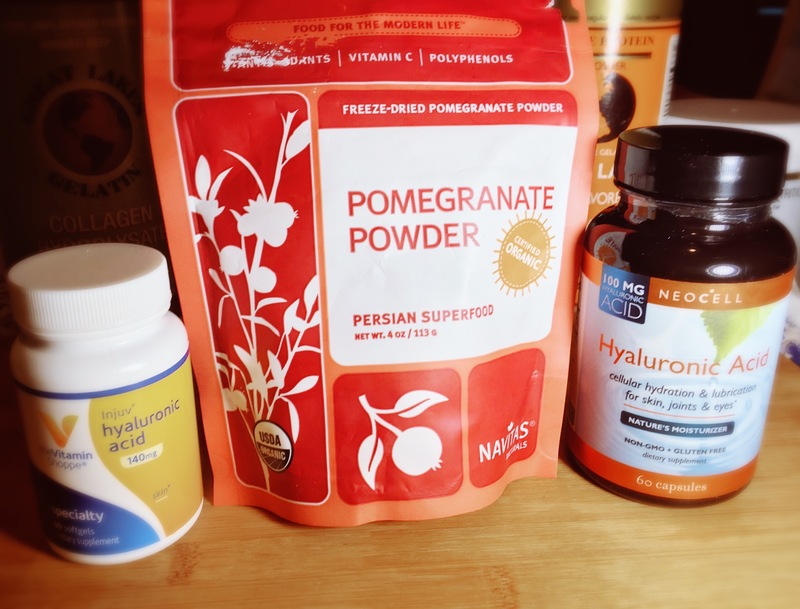 The secret is the cranberry juice and added super fruit powder (in this case Navitas Naturals Organic Pomegranate Powder) which provide both a sweet-tart flavor and added Vitamin C which, along with supplemental hyaluronic acid, are key to helping your body assimilate the collagen. Think of them as a power booster for the collagen protein, and they happen to taste great. 1. Brew tea using 6 oz. filtered or distilled water per sachet. Allow tea to steep at least 5 minutes before removing sachet. 2. At this point, I like to reheat the tea for a few seconds on HIGH in my microwave because I dislike lukewarm tea, but that’s totally optional. Remove and discard green tea sachet. 3. Stir 1 scoop (Tbsp.) hydrolyzed collagen into hot tea. Continue stirring gently until collagen is completely dissolved. ***Stevia and all other natural or artificial sweeteners (with the exception of pure, no-sugar-added juice) are not permitted during #WHOLE30. For a complete list of #WHOLE30 program do’s and don’ts as well as answers to just about any and all #WHOLE30 questions you may have, I highly recommend you check out the program rules here and other resources available at WHOLE30’s website to educate yourself prior to beginning your own WHOLE30 journey or anytime you have questions or need some support (the Facebook and Twitter feeds are tremendous sources of encouragement and support). 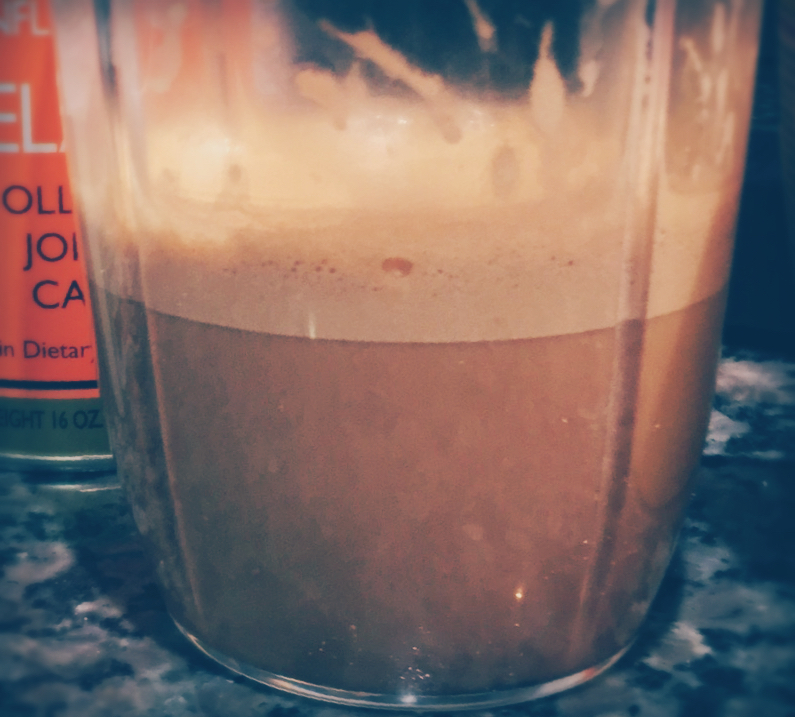 This recipe is essentially my #WHOLE30 Bullet-Proof Coffee with collagen. It’s also very similar to the original recipe from The Coconut Mama, located here. But lately, I’ve been really enjoying the deliciously creamy and #WHOLE30 approved Nut Pods Original Unsweetened Coffee Creamer. BTW, I’ve also tried their Unsweetened French Vanilla-flavored Coffee Creamer and love it too! Nut Pods are great for those times when I need some coffee but don’t wanna risk waking the baby by running the Nutribullet. I highly recommend Nut Pods! 1. Brew coffee using 6-8 oz. filtered or distilled water. 2. While coffee is still very hot, carefully pour into blender canister along with all other ingredients and stir briefly until collagen is dissolved. Place canister on blender base and cover with lid. 3. Blend mixture for a few seconds on HIGH until frothy. N.B. This recipe can be made without use of blender if using Nut Pods Creamer instead of coconut oil. 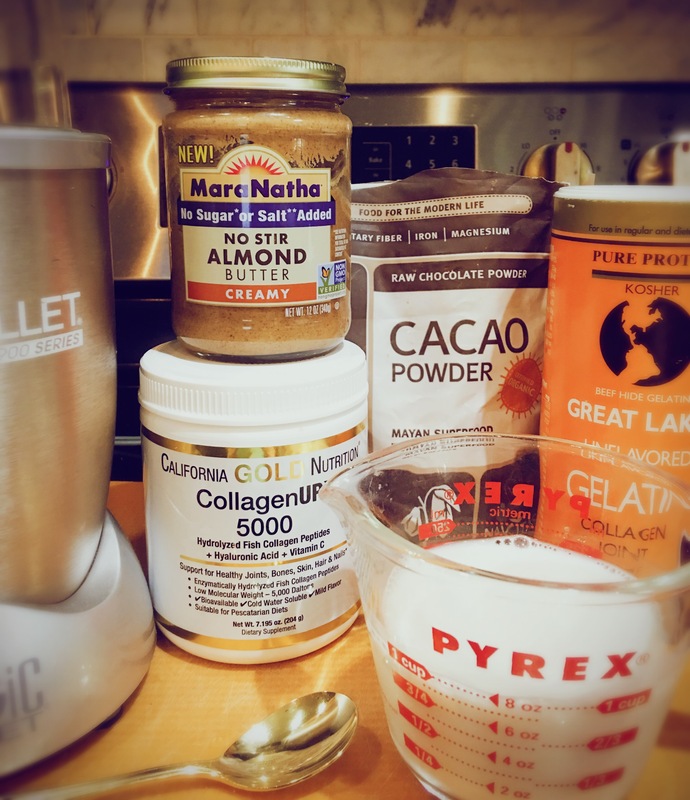 But even when using Nut Pods creamer, I still like to give my collagen coffee beverages a quick whir in the blender to ensure everything is well-combined and frothy. 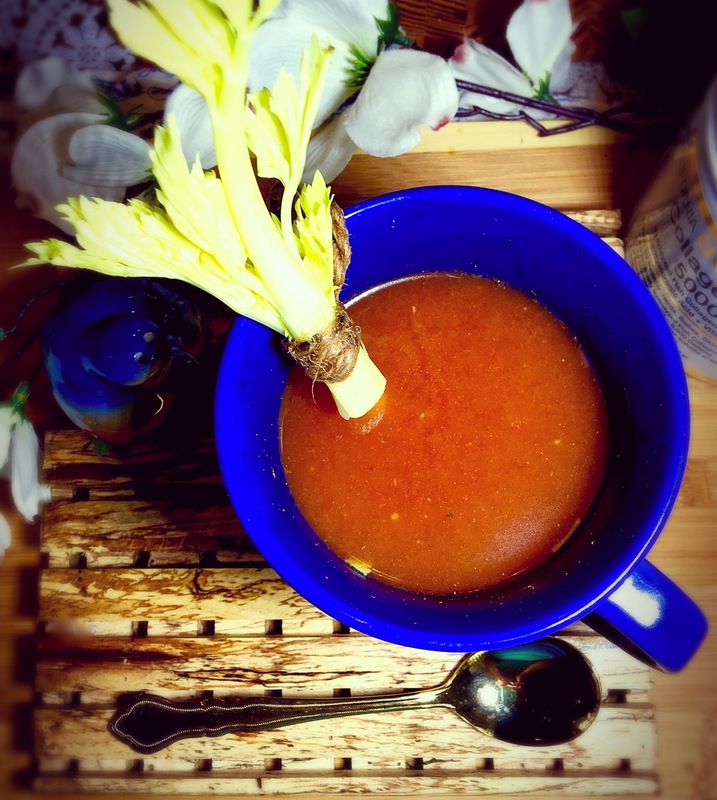 This warm, savory drink is incredibly soothing and satisfying. It’s a terrific afternoon pick-me-up for tired mommies (like me)! The protein helps tide me over until dinner and the vegetable juice provides some extra Vitamin C + Potassium. You could use store-bought broth, provided it doesn’t contain any sulfites, MSG or other nasty additives. If you’re new to making bone broth, you can read up on the process and find some easy+delicious recipes from Paleo Leap here and The Wellness Mama here. 1. 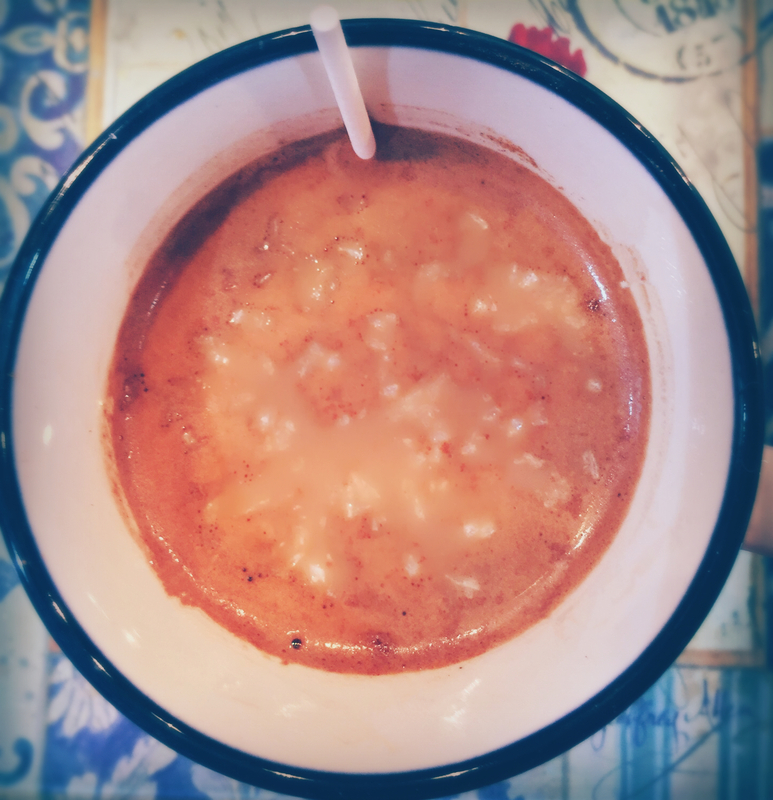 Gently heat bone broth in microwave or on stovetop until a little hotter than desired temperature. 2. Remove from heat, and gently stir in 1 scoop hydrolyzed collagen and 1 tsp. gelatin (if using), continuing to stir until collagen + gelatin are completely dissolved. 3. Next carefully pour broth mixture into large mug. Then add the vegetable juice and (if desired) lemon juice. 4. Taste for seasonings, adjusting as needed. This is my current favorite lunch. I can make it quickly and drink it while chasing after my 9-month old daughter who is now constantly in motion. Containing several super star foods from the HealthGrove list of top 30 foods for beautiful skin and hair, this shake is thick, creamy and delicious! The spinach provides a hefty dose of nutrition including Folate, Magnesium, Potassium and Vitamins A, C, E, B2 & K. Read more about spinach here. The almond butter imparts a yummy nutty flavor that goes so well with the cocoa. Almonds also provide more Vitamin E antioxidants, some extra protein and healthy fat (thereby boosting the satiety factor of this shake). Read more about almonds’ nutrient values here. 1. 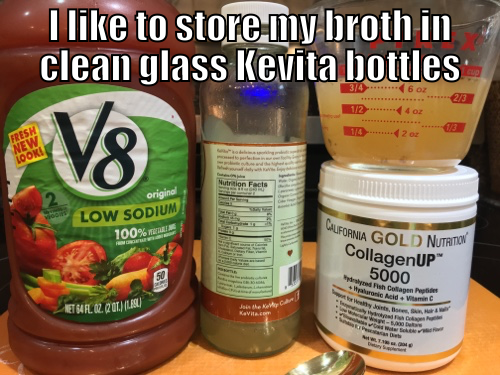 If using gelatin, stir into 2 Tbsp. filtered water and allow to sit for a few (3-4) minutes. Combine milk and collagen in blender canister and whisk briefly with a fork until collagen mostly dissolves (there will still be a few collagen “lumps” but that’s okay). 2. 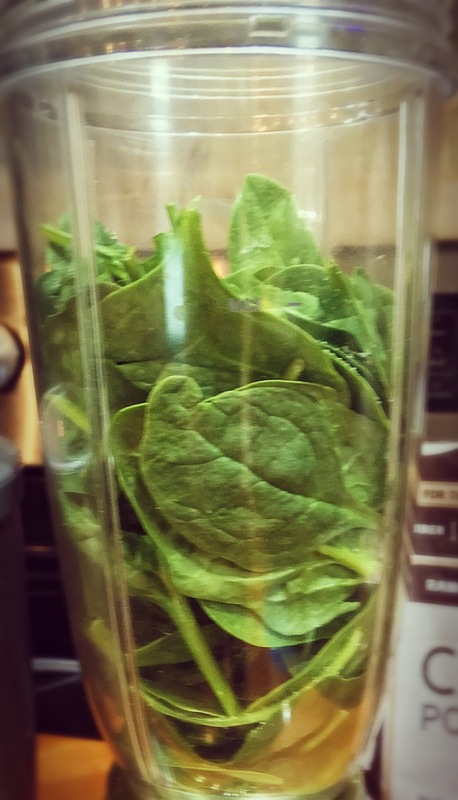 Put spinach into blender canister then pour in milk+collagen mixture into blender along with all other ingredients. 3. Place canister on blender base. Cover with lid and blend mixture for a few seconds on HIGH until frothy. 4. Pour into 2 freezer-safe mug or jars with lid. Freeze for about 1 hour or enjoy immediately. N.B. If you don’t have access to homemade nut milk, you can substitute ½ cup Nut Pods Original (or flavored) Unsweetened Coffee Creamer + ½ cup filtered water. Stir briefly to combine creamer and water. Then add collagen and proceed as above. 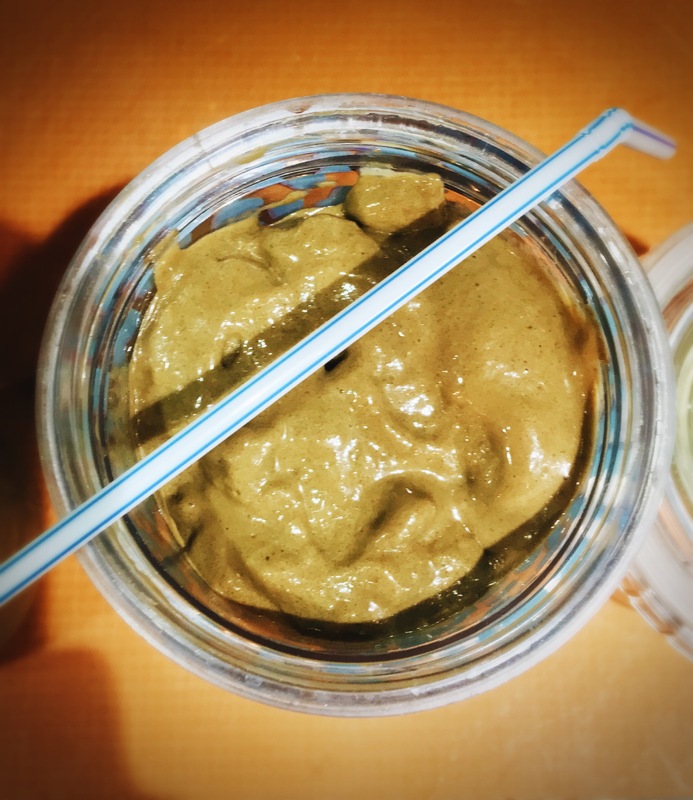 BTW: Don’t be dissuaded by the slightly greenish color of this shakes. It’s delicious and Hubs swears “it’s as good any ice cream!” I like to save half this recipe and keep in the freezer until after dinner. It’s the perfect dessert. This video from Emily Noel of Beauty Broadcast is fantastic in content and simplicity. 1. Borumand & Sibilla S. Effects of a nutritional supplement containing collagen peptides on skin elasticity, hydration and wrinkles, 2015. Journal of Medical Nutrition and Nutraceuticals; 4(1), 47-53. Online full text article link. 2. Ohara H, Ito K, Iida H, Matsumoto H. Improvement in the moisture content of the stratum corneum following 4 weeks of collagen hydrolysate ingestion. Nippon Shokuhin Kogaku Kaishi 2009; 56: 137-45. Online link to abstract here. skin properties. ITE Lett Batteries New Technol Med 2006; 7:386-390. Full text unavailable. See other cited article links (above and below) for summary of this study. 4. 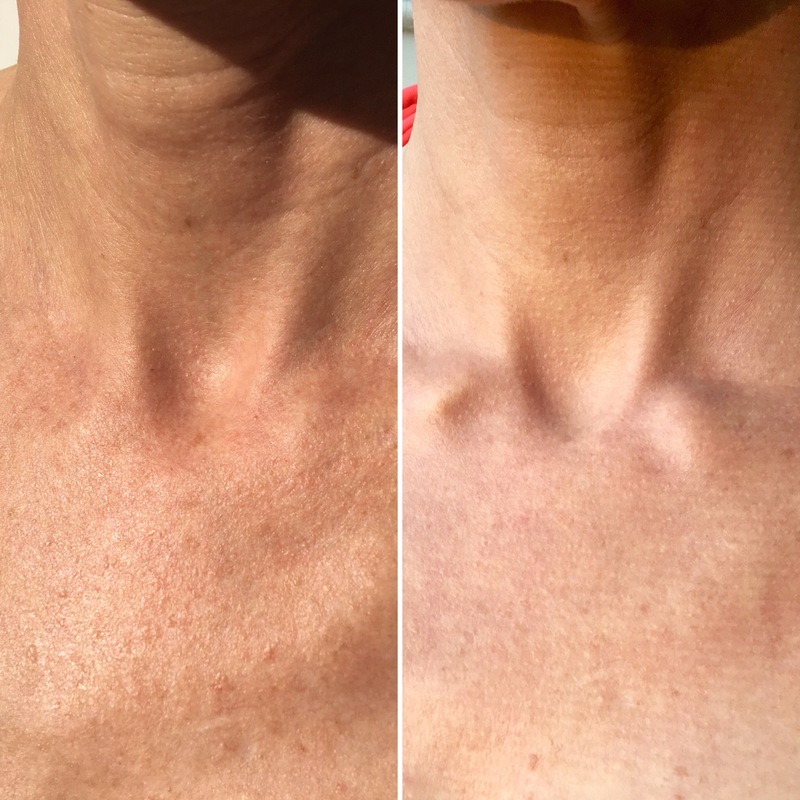 Sibilla S, Godfrey M, Brewer S, Budh-Raja A, Genovese L. An Overview of the Beneficial Effects of Hydrolysed Collagen as a Nutraceutical on Skin Properties: Scientific Background and Clinical Studies. The Open Nutraceuticals Journal 2015; 8: 29-42. Online full text article available here. 5. Dr. Tim O’Shea of The Doctor Within on Hydrolyzed Collagen Supplementation. Link here. 6. 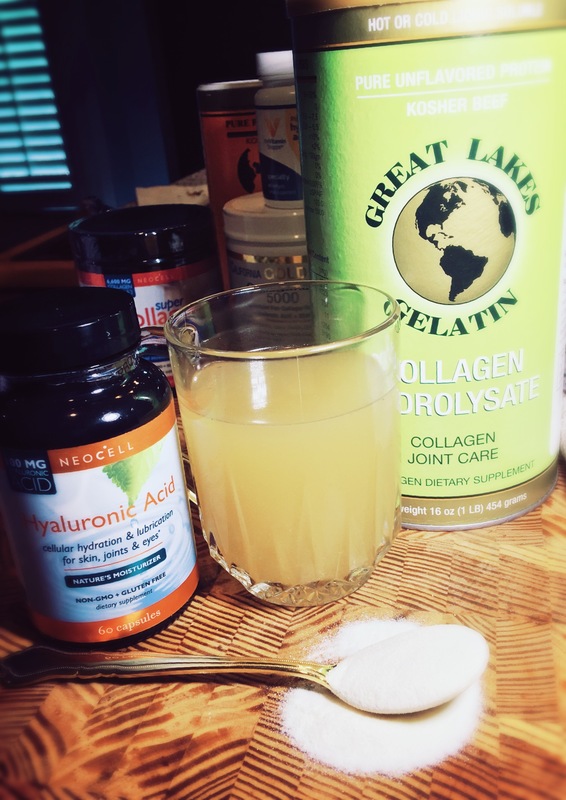 All About Gelatin & Collagen from Paleo Leap. 7. And you’ll want to check out this list of Studies on Collagen Supplementation from Collagen Complete. 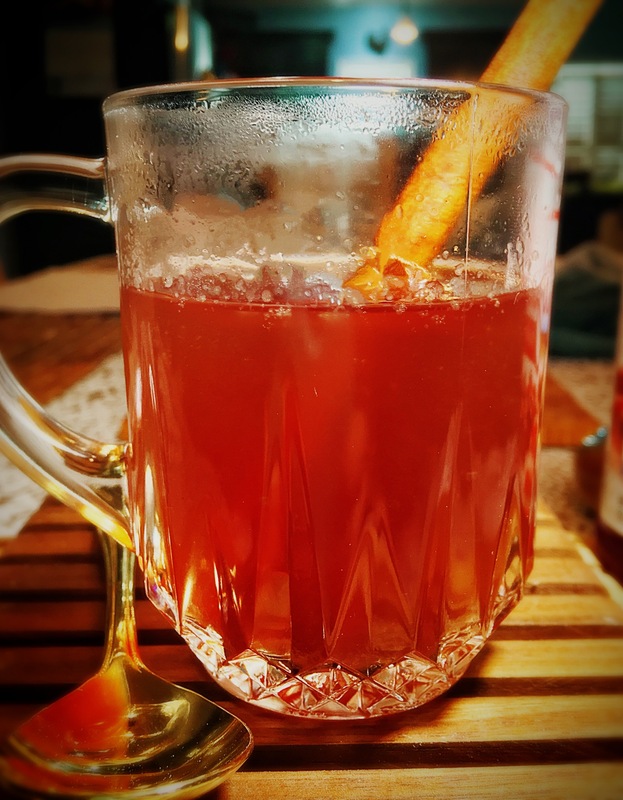 This entry was posted in Beautiful Basics, Beverages, Food & Nutrients for Beauty, Habits & Patterns, Pretty Food, Whole30 and tagged #antiaging, #beauty, #dairyfree, #glutenfree, #JERF, #pale, #SKIN, #WHOLE30, Primal. An Anti-Aging Elixir – Yes It Does Exist!!! We all know it’s important to take care of our skin as we age – to remove makeup every night; to always (ALWAYS) apply broad spectrum sunscreen with a rating of at least SPF30 regardless of the season or time of year; and to use other topical skin-beneficial ingredients like antioxidant serums, retinoid creams, and the like. But when it comes to skin health, what we put into our bodies is just as important as the lotions and potions we apply to the skin. For healthy youthful skin, experts recommend drinking lots of pure water, staying away from too much sugar, avoiding cigarette smoke, eating foods rich in Omega-3 fatty acids, and reducing/eliminating alcohol consumption. But what if I told you there’s a nutritional drink scientifically proven to significantly decrease wrinkles (especially your deepest wrinkles); to improve your skin’s elasticity; and to increase your skin’s overall hydration levels? Would you be interested? Turns out such a miraculous concoction does exist. 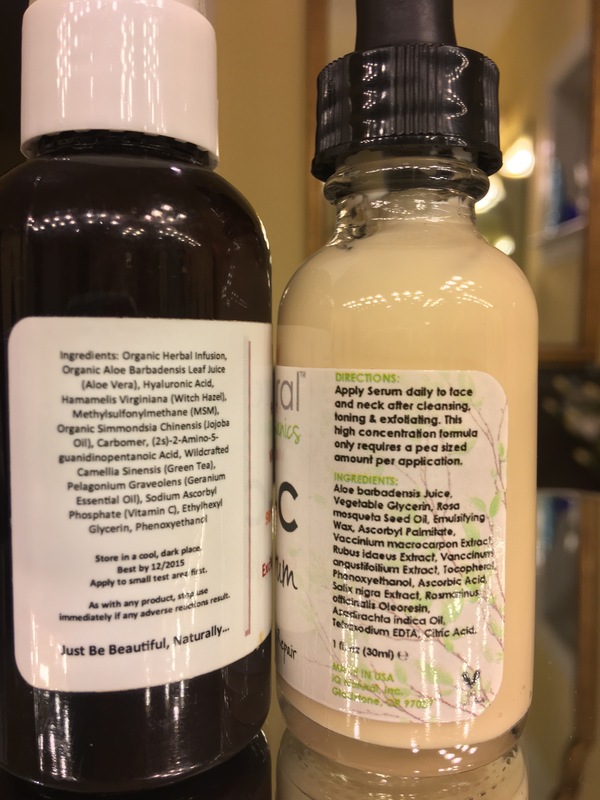 The foundation for this anti-aging cocktail is collagen. In humans collagen is a key component of the skin, hair and nails and makes up nearly 30% of our bodies’ protein composition (Borumand & Sevilla). Sadly, collagen production decreases as we age, causing a number of common aging complaints – wrinkles, sagging skin and loss of skin tone and elasticity. Recent technical advances have produced a supplemental form of collagen that, when consumed in conjunction with certain other key nutrients, effectively combats age-related collagen loss and associated skin concerns. But Haven’t Gelatin Supplements Been around Forever? You may have seen gelatin tabs or powder gelatin supplements in stores. They’ve been around for a while. But researchers say those old-school gelatin capsules and supplements are all but worthless. That’s because the body isn’t able to break down those gelatin proteins to create the necessary building blocks for stronger hair and nail structures. N.B. Our hunter-gatherer ancestors often consumed the skin, bones and connective tissues of wild or free-range meats and fish. These sources do provide collagen more readily digested and assimilated by the human body. However, most modern diets do not include sufficient amounts of these food sources of usable collagen. Therefore supplementation is recommended. So #paleo diet folks and #whole30 fans alike can rest assured that hydrolyzed collagen supplementation is completely compliant with their chosen food regimens. According to Borumand & Sibilla (2015), previous “oral (collagen/gelatin) treatments for skin aging have been unsuccessful due to their constituents being broken down by acid and enzymes in the gut; however several studies have shown that hydrolyzed collagen is absorbed in the gut and then delivered to skin and joints through the blood stream (see reference 1 below).” Researchers have also found that consuming hydrolyzed collagen along with oral hyaluronic acid and Vitamin C produces the best results and efficacy. Several recent studies have reported impressive wrinkle-reduction and skin hydrating results using a cocktail of supplemental hydrolyzed collagen, hyaluronic acid (HA) and Vitamin C. Borumand & Sibilla found that this combination resulted in 25-50% skin hydration levels among study participants. They also noted significant decrease in wrinkle depth among those receiving the hydrolyzed collagen+hyaluronic acid+Vitamin C cocktail. An earlier study by Ohara et al. (2009) using a combination collagen+HA+Vitamin C supplement produced similar results in terms of improved skin hydration and increased elasticity. But in this study, participants over age 30 displayed the most significant wrinkle-reduction results (see reference 2 below). So the evidence definitely supports this combo of supplements for improving skin-related aging complaints. Perhaps you’re eager to try out these supplements for yourself. You’ll first need to decide which hydrolyzed collagen, HA and Vitamin C option or options are best for you. I have listed some options for each below. Where possible, I’ve included comments based on my own experimentation with these products. I should note that no evidence has been found indicating any negative side effects from collagen supplementation. I personally have a pretty delicate system. There’s lots of things I cannot take, but I’ve never had any problems or side effects from the collagen, HA and superfood C products I’ve tried. Nevertheless, we are all different. You may respond more favorably to one brand of hydrolyzed collagen (or HA or C) over others. It may take some experimentation to discover the best combo for you. Here are some options to consider. 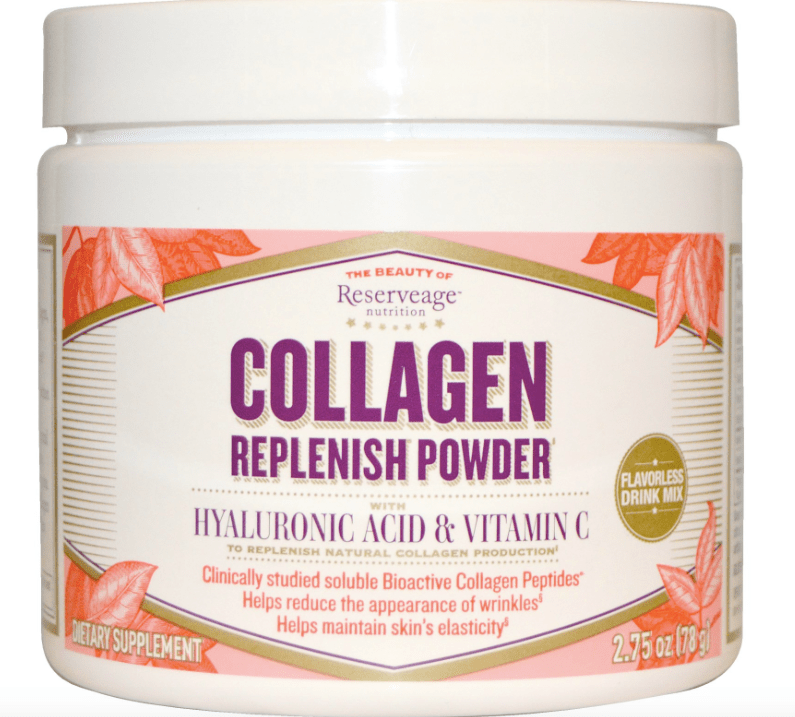 • Reserveage Organics Collagen Replenish (for $15.79 for just 2.75 oz.) provides 2,500 mg. of hydrolyzed collagen + 20 mg. of hyaluronic acid and 60 mg. of Vitamin C (ascorbic acid). This one is pretty pricey compared to other hydrolyzed collagen options below but earns points for convenience by combining all 3 necessary supplements into one powder form. 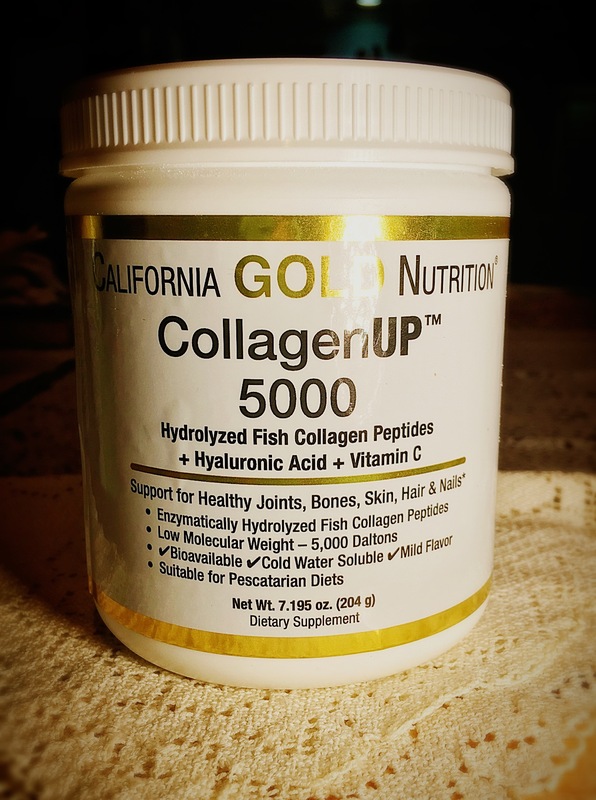 • California Gold Nutrition CollagenUp ($12.95) contains 60 mg. each of hyaluronic acid and Vitamin C along with 5,000 mg. of hydrolyzed collagen (from fish). This product is odorless and tasteless in every beverage I’ve tried. It does require a bit more stirring to dissolve (compared to the NeoCell Super Collagen below). 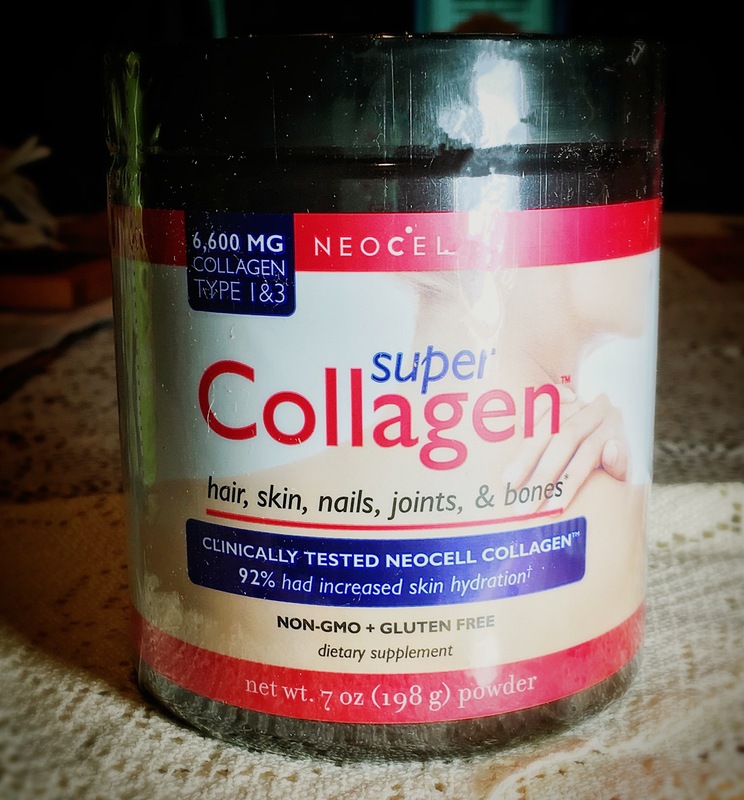 • NeoCell’s Super Powder Collagen ($10.84 for 7 oz.) provides a whopping 6,600 mg. of hydrolyzed collagen. But it doesn’t include added Vitamin C or hyaluronic acid, so you’ll need to find those from other sources. N.B. NeoCell produces and recommends their own hyaluronic acid, but I suspect any well-made HA will work in conjunction with the NeoCell Super Powder Collagen. 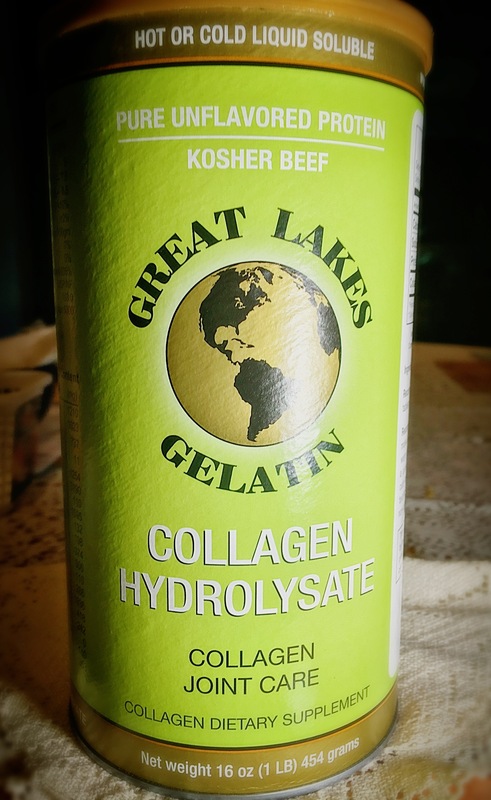 • Last but definitely not least, Great Lakes Gelatin Co., Collagen Hydrolysate, Collagen Joint Care, is available from Amazon and iHerb along with other online sources. Price varies from $21-25 (generally around $23) / 16 oz. This amazing collagen product is odorless and tasteless (some reviewers report it has a slightly “meaty” flavor), dissolves quickly in hot, warm or cold liquids and offers pure hydrolyzed beef collagen – 6,000 mg. (6 grams) per Tablespoon. It’s worth noting that one (male) iHerb reviewer actually described this collagen as “better than Botox.” See that review here. Now that’s my kinda supplement!!! • Vitamin Shoppe brand makes a terrific hyaluronic acid product, Injuv Hyaluronic Acid 140 mg. I’ve used and enjoyed this product without any negative side effects. It has a very high level of hyaluronic acid per (2 gel-tab) dose, providing 140mg. relative to most other HA supplements, most of which provide no more than 100mg. of HA per dose. And because it’s Vitamin Shoppe brand, you’re sometimes able to get discounted prices for this product, especially if you’re a loyal Shoppe buyer. • Neocell’s Hyaluronic Acid, Nature’s Moisturizer product provides 100mg. of HA per 2 capsule dose ($19 for 60 capsules). This one is reasonably priced and is another great HA option. Back in the day, the options available for Vitamin C supplementation were all lab-generated (often synthetically created) pills and sugary Vitamin C chewables. One problem with these options was the “GI distress” many people suffered when taking more than 1,000 mg. (1 gram) of Vitamin C per day. 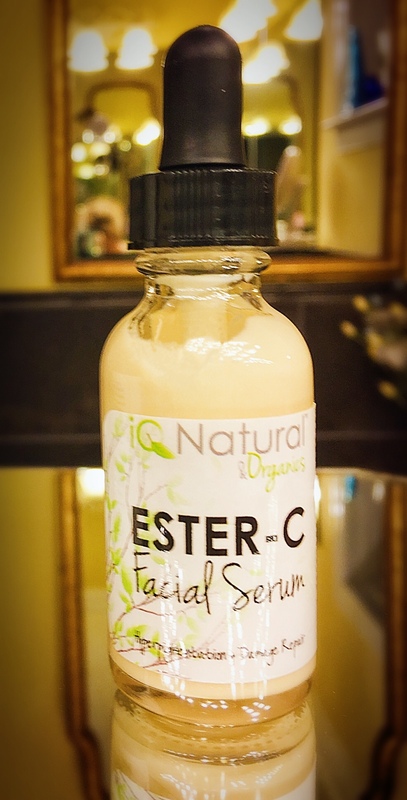 Next came Vitamin C Ester, highly touted by such skin/beauty gurus as Dr. Nicholas Perricone (of PBS and Perricone Prescription fame) who has been a big proponent of Vitamin C Ester, a different version lab-created C option. Some people claim Vitamin C Ester results in less digestive upset than traditional Vitamin C. However, several exerts (references here and here) state that Vitamin C Ester is chemically so different from the form readily recognized by the human body that it is less effective (than say Ascorbic Acid). In the past few years another, more natural Vitamin C options have become widely available – C supplementation through consumption of concentrated essences of so-called “superfoods,” such as pomegranate, Camu Camu, acerola and others. These sources of Vitamin C are reportedly the most readily used by the human body and are the least likely to cause digestive side effectives (reference here). Hooray! Finally an answer to the C debate. There are some excellent “superfood” supplement options available to help you meet your Vitamin C needs. Here are a few to consider. 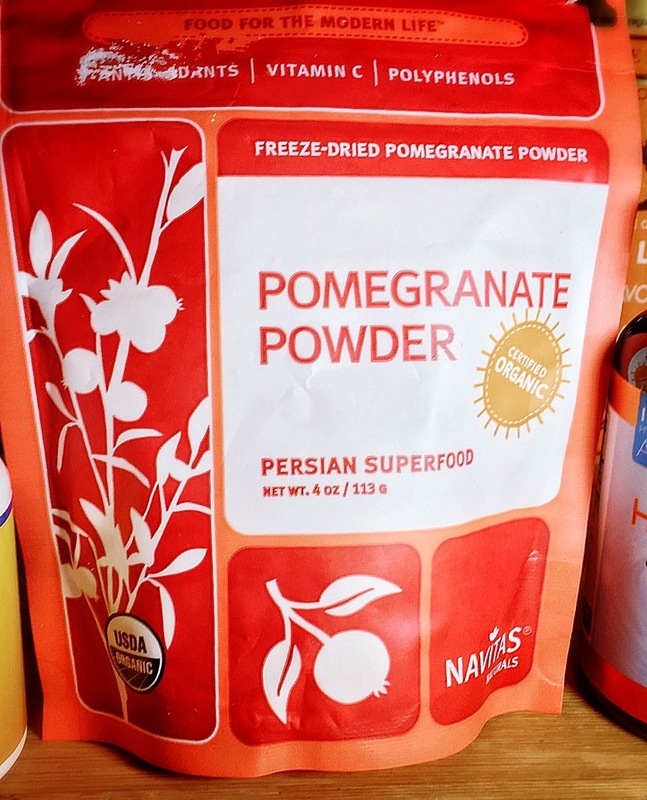 • Navitas Naturals, Organic, Pomegranate Powder (pictured above) – Tart and sweet this bright orange powder dissolves quickly in liquids and imparts a nice pomegranate flavor. Just 1 Tbsp. of this powder provides 130% of your (adult) RDA for Vitamin C. And it’s certified organic, raw, kosher, gluten-free and non-GMO. Navitas claims this product provides a, “potent source of naturally occurring phytonutrients and superior antioxidants like polyphenols, ellagic acid, tannins and anthocyanins. When consumed, these compounds are strong free-radical fighters, providing added protection against cellular damage.” I like this supplement a lot. 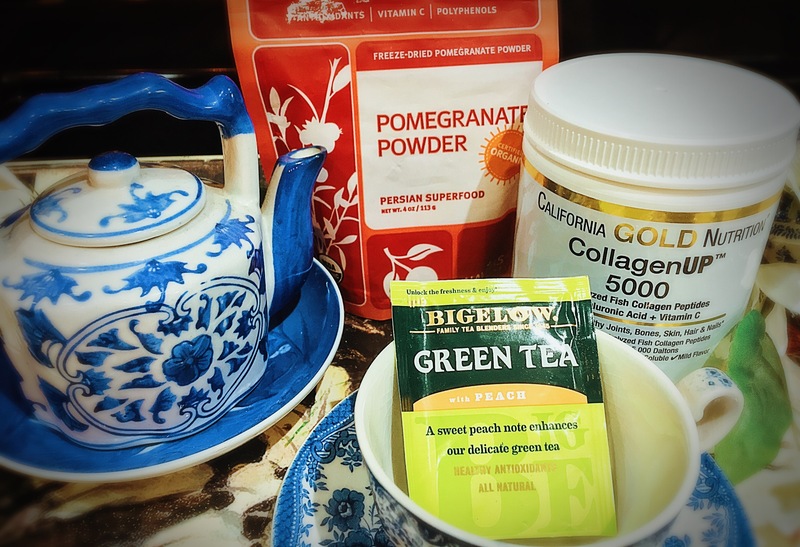 This is what I used in the Get Glowing Green Tea recipe which will be posted separately along with a few other collagen+HA+C beverage recipes. • Navitas Naturals also makes an organic, raw Camu Camu powder supplement that boasts an almost too-good-to-be-true 1180% RDA for Vitamin C in just 1 teaspoon! The reviews for this product and the Sunfood version state pretty consistently that both companies’ Camu powdered supplements taste pretty bitter; though the Sunfood version seems to be less bitter (it also provides less Vitamin C). • You may prefer to take your super fruit supplement in capsule form. If so, this product, Pure Radiance C Veggie Caps from The Synergy Company ($22.34 for 90 caps) is a great option. Based on The Synergy Company’s “proprietary blend of all whole food extracts,” including Camu Camu berry extract, manioc root, acerola berry extract, among others, just 1 of these capsules provides 200% of the RDA for Vitamin C as well as several naturally occurring co-factors and other antioxidants. As stated above, I will soon be posting several beautifying and anti-aging “cocktail” recipes using this combination of nutrients. So be on the lookout for that! In the meantime, do some shopping. Find the right hydrolyzed collagen, hyaluronic acid and Vitamin C supplements for you! I encourage you to check out the referenced articles below if you’d like to some more research on this anti-aging combo for yourself. And if you’re interested in reading about my preferred form of topical hyaluronic acid, be sure to check out this post. Time to identify and correct some possible beauty mistakes you may be (unknowingly) making. Check out this list of 20 frequently-violated beauty rules from Listotic. 1. Effects of a nutritional supplement containing collagen peptides on skin elasticity, hydration and wrinkles (2015). Borumand & Sibilla S. Journal of Medical Nutrition and Nutraceuticals; 4(1), 47-53. Online full text article link. This entry was posted in Beverages, Food & Nutrients for Beauty, Pretty Food, Whole30 and tagged #antiaging, #beauty, #PALEO, #SKIN, #supplements, #WHOLE30. I’ve mentioned previously that I have ADHD, and I often attribute my tendency to lose interest in cosmetics to my general attention deficits. But the truth is, like most women in this culture, exposed to near constant beauty ads and media images, I’m just constantly on the look-out for the next best thing, for that magic bullet that will make my skin perfect and that will finally disguise all my perceived imperfections. I’m a marketer’s dream because I bite on all the product hook lines and chase after every sales pitch. As a result, I generally never get around to finishing the cosmetic products I purchase. Product empties are a rarity for me. So, when I found myself preparing to dispose of 5 empty bottles and 1 completely spent sponge, I felt a post was in order to describe these fantastic products and what makes them special to me. 1. Paula’s Choice RESIST Super Antioxidant Concentrate Serum: Retails for $36 for 1 oz. from Paula’s Choice.com or Dermstore (plus 10% savings if this item is listed among your Dermstore “favorites” list). I adore this serum. It’s possibly my favorite antioxidant serum of all time! Plus it doesn’t contain any retinoids so I used it throughout my pregnancy and while breastfeeding, so I’m (admittedly) somewhat sentimental about this product. But even without sentimentality, this is an elegantly formulated serum that’s well-suited to all skin types and covers all your antioxidant needs. Among other ingredients it contains peptides, ceramides, and Ubiquinone (nearly identical to the star ingredient in the über expensive Prevage MD product line which features idebenone, a synthetic form of ubiquinone), along with nourishing soybean and palm oils, turmeric, bearberry and mushroom extracts. But what really excites me is the combination of multiple forms of stabilized Vitamins C and E in combination with ferulic acid. That’s nearly identical to the ingredients of the ridiculously expensive Skinceuticals C E Ferulic Serum ($163/oz.) from Dermstore and when purchased at physicians’ offices. But the Paula’s Choice serum is more user-friendly because it’s in an air-tight tube (not dropper-style). And of course, the Paula’s Choice serum is less than 1/4 the price. That adds up to a pretty wise beauty buy in my book! 2. 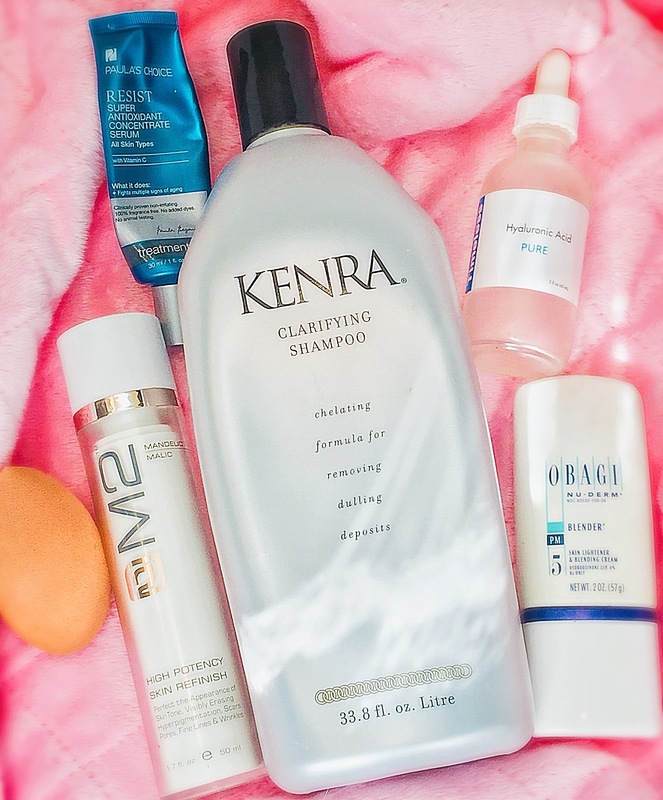 Kenra Professional Clarifying Shampoo Chelating Formula: I am so in love with this shampoo, and it’s so under-rated. I’m like on a crusade to get this product its due respect! It retails for $13 for 10.1 oz. from ULTA or $32 for 33.8 oz. from Amazon. You can also purchase it in some salons (including occasionally at the “salons” inside select Wal-Mart superstores) at varying prices and sizes. I love this shampoo because it is hands-down the best clarifying product I’ve ever found. It removes styling product build-up better than anything I’ve ever tried and does so quickly, requiring only wash and very little scrubbing. Okay, so it’s not a gentle sulfate-free co-washing type product (it’s called chelating for a reason). And I have color-treated, very fine, fragile hair, so I only use it about once a month. But it’s so effective that’s really all I need to use it. Afterwards, my hair is shinier and has more volume, because it’s not weighed down by all that excess build-up. Bonus, this shampoo is hands-down the best makeup brush and sponge cleaner I’ve ever found! The larger size/price comes in at just under a $1/ounce – an absolute steal when you consider that the “value sized” 10 oz. BEAUTYBLENDER liquid blender cleanser® retails for $30 ($3/oz.). This product is the ultimate multi-tasker and a beauty bargain to boot. I simply cannot recommend this shampoo highly enough. 3. Timeless Skincare The Original Hyaluronic Acid 100% Pure: Retails for $13.16 for 2 oz. from Amazon.com Hyaluronic Acid is a big buzz ingredient these days in skincare. But it’s been around for a while (it’s most commonly used as an injectable filler). It doesn’t have the same (longer lasting) effects when applied topically, but has a nice skin-plumping effect and is a great addition to your existing anti-aging skincare routine. Turns out it’s pretty difficult to get HA in a stabilized form for topical application, so it’s usually pretty expensive. For example, I’ve also ordered and enjoy using Paula’s Choice brand Hyaluronic Acid Booster (seen here) which retails for $45 for 0.67 oz. Now admittedly, the PC’s HA product has a few more bells and whistles (several ceramides, adenosine and panthenol). But since I’m already using some pretty outstanding serums and lotions, I don’t mind saving a little money when it comes to my HA booster. And this one is a steal at only $6.58/ounce! It mixes in with nearly other treatment, lotion and potion I use and is especially great patted on top of foundations or powders, making the cakiest of applications look smooth and lovely. It’s a wonderful perk-me-up that never disrupts the pre-existing application. I like to pat it onto my eye area when I’m looking more wrinkly or tired than usual, which seems to be more often these days (i.e. since becoming a mom) and probably accounts for the recently emptied bottle. 4. Obagi Nu-derm Exfoderm Blender: Price varies, available only from physicians’ offices. In general, retails for around $100 for 2 oz. Read more about this product at Obagi.com. I was first introduced to Exfoderm Blender by the same Aesthetic Nurse Practitioner who, not coincidentally, also introduced me to one of my favorite products ever, Revision Intellishade, about which I’ve already written at length here, so I’ll spare you further rhapsodizing about it here. Suffice it to say, I trust this brilliant woman’s opinion. She never steered me wrong and the Exfoderm Blender is yet another example. Blender contains 4% Hydroquinone, probably the most-researched, most scientifically-supported skin-lightening ingredient. It’s important to understand how hydroquinone works because some people mistakenly think that it “bleaches” the skin which is untrue. Hydroquinone actually works by preventing melanin (skin pigment) production. It’s effective when used as part of a comprehensive skincare regimen that absolutely must include broad-spectrum sunscreen. For more on broad-spectrum SPF, check out this article. And if you’re interested in reading more about hydroquinone, are considering using yourself and just fancy a bit of fascinating cosmetic chemistry reading, check out this summary from Beautypedia. But back to why I love this product: I’m ashamed to admit I was very unwise about sun protection when I was younger. I even frequented tanning salons in my teens and 20s. Horrifying, I know! I had a couple sun spots on my cheeks in my early 30s, and this stuff knocked ’em out in less than 6 weeks. With consistent sunscreen application, those pesky sun/age spots on my cheeks have never returned (thank goodness). But unlike PC’s RESIST Super serum, I wasn’t able to use this product during my pregnancy or while breastfeeding. 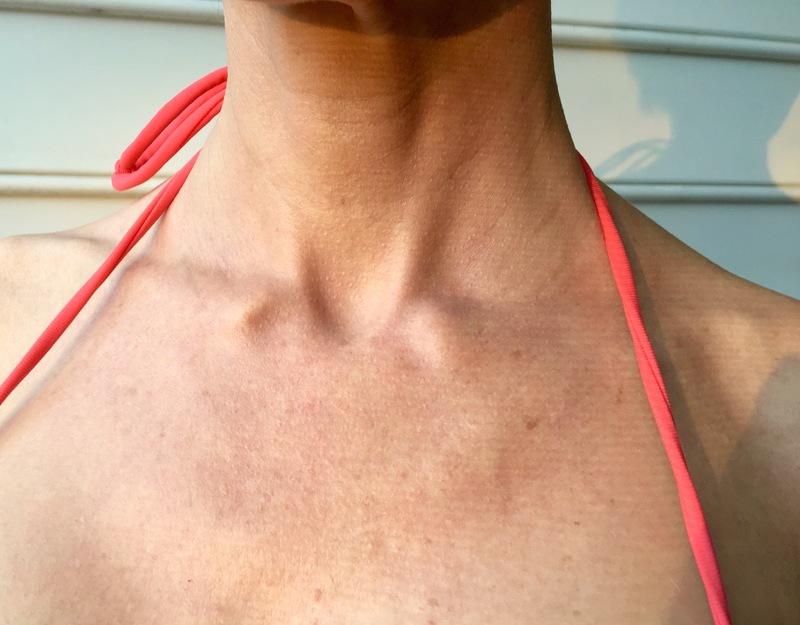 And despite my best efforts and lots of sunscreen, like many women, I developed some sun sports and hyper pigmentation (this time on my neck and chest) during my pregnancy. So I was super excited to resume using Exfoderm Blender as soon as my daughter was weened. Now that I’ve finished this bottle, I hope to purchase another one as soon as our budget allows for it. It ain’t cheap, but it’s really effective! 5. M2 Skincare High Potency Skin Refinish Retails $49.98 for 1.7 oz. at Dermstore. I was first introduced to this product a few years back when I received a deluxe sample along with an order I purchased from Dermstore. After testing that sample just once, I immediately ordered the full-sized product. Since then (about 4 years ago now), I’ve yet to experience any other exfoliant that even comes close to performing as well. Skin Refinish is great because it combines mandelic and malic acid exfoliants, which are gentler forms of glycolic acids at a pH that actually works. Along with the acids, M2 includes the ever-popular antioxidant ubiquinone (noticing a trend here? ), some other antioxidants (like algae extract), hyaluronic acid and some aloe leaf extract for soothing. The packaging M2 selected is especially thoughtful. 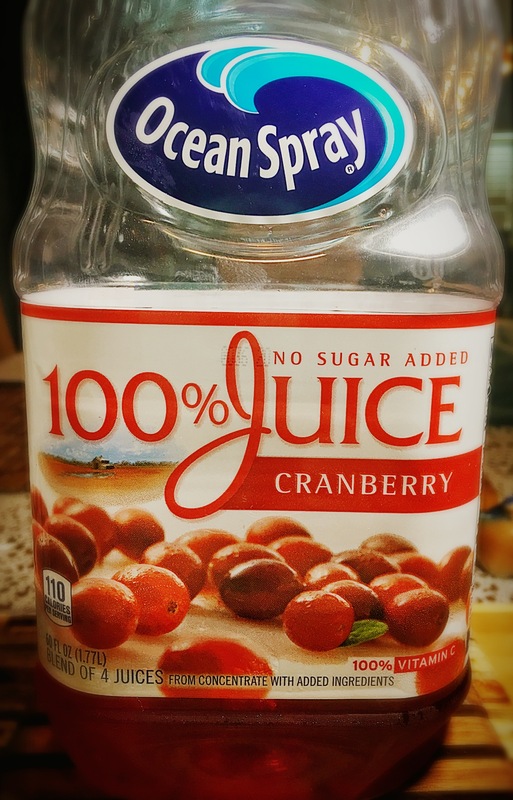 Hubs calls it “space-aged.” The bottle is frosted to avoid any light or sun damage to the ingredients (antioxidants readily breakdown and are rendered useless in the presence of light and air. N.B. that’s why expensive jars of cream claiming to provide tons of antioxidant ingredients are such a ripoff – because the prized ingredients will be rendered ineffective in a matter of days after opening). You have to twist the nozzle on the Skin Refinish bottle before the pump appears allowing you to dispense the product. Then you twist the top again, and the pump dispenser disappears back into the bottle. Pretty cool! And most importantly, it preserves the integrity of the precious ingredients inside. I use this product once per week, every Saturday night, and I immediately notice a difference in my skin. Then the next morning I wake up with brighter, tighter, glowing, more youthful skin. I love it! The most impactful exfoliant ever! Far superior to any grainy scrub. I already have my next bottle ready and waiting, so tossing this one was not too painful. 6. Real Techniques Miracle Complexion Sponge: Retails for $6.99/each at ULTA or $10.99 for 2 sponges (also at ULTA). Incidentally, ULTA usually offers a buy one, get one 50% deal on these little guys. So, doing the math, that would be 4 sponges for $16.49 (plus tax obviously), or a little over $4.12/sponge. Not bad when compared to that famous pink sponge that costs $20 per! I know, I know. The two are not perfectly comparable. And this may be sacrilegious to some, but for day-to-day makeup application, I actually prefer the RT version! Feel free to hit me with angry comments. I promise to respond to each one 🙂 But I dislike the idea of using a $20 for everyday applications. Sure I like the almighty BeautyBlender too. They’re great. But I tend to save my super-snazzy, jewel-like pink egg sponges for those occasions when I’m getting all dolled up for something special. For one thing, most of the time, I’m not applying a full face of foundation. Most days I’m sticking to simple Tinted Moisturizer and for that, I prefer the flat side of the RT sponge to smaller rounded BB. For another thing, I like the softer texture of the RT for day-to-day application. The RT tends to lay down lighter coverage, which again, is more appropriate for daytime, informal usage. And finally, I use RT sponges most of the time because I’m really rough on my sponges. I routinely use the same sponge for tinted moisturizer or BB cream; to dab on a little cream foundation over said BB cream (just where I need a little more coverage, you understand); to dip into cream concealer or to dot on some color corrector; to smudge out bronzer or blush; and to smooth out my high SPF powder foundation. I even use the pointy tip to go over the (often) messy areas of my eyeshadow. At the end of the day, there’s a whole lot of color product built up on my sponges. I try to be consistent about cleaning my sponges, but I do have a baby and a husband after all. So if I have dispose of my sponges more frequently that say, every 3 months, I’d prefer not to suffer massive pangs of financial remorse every time I toss one. I feel better by saving a little cash and using the RTs most of the time, especially since the performance is really good! Check out this informative video from Makeup Geek as she shares the top reasons why we (all at one time or another) have experienced this unpleasant phenomenon, and more importantly how to avoid it! Be sure to subscribe to Daily Beauty Wisdom to automatically receive new posts sent directly to your inbox of choice! This entry was posted in Beauty Bargains, Beauty Product Reviews, Beauty Treatments, Gadgets & Procedures, Educate Yourself, Like This, Try That, Your Crowning Glory and tagged #beauty, #COSMETICS, #momlife, #productempties #hair #makeup #bblogger, #SKIN, #SKINCARE. 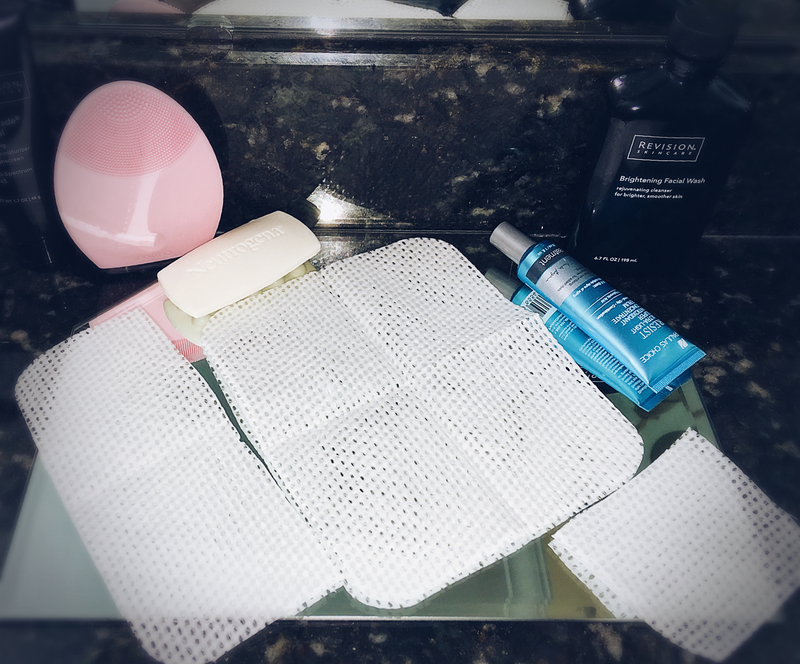 This entry was posted in Beauty Bargains, Beauty Product Reviews, Beauty Treatments, Gadgets & Procedures, Like This, Try That, Product Reviews and tagged #beauty, #beautyproducts, #hair, #momlife, #SKIN. A Truly One-Size-Fits-All Cleansing Cloth? Almost! Remember how your mother (or grandmother) taught you to wash your face every night by telling you horror stories about what would happen if you slept in your makeup – like how your eyes would be swollen shut the next morning due to some terrifying affliction nobody’s ever heard of, or that you’d develop giant blackheads that would get infected just in time for the big homecoming dance? Yeah, I never got that. 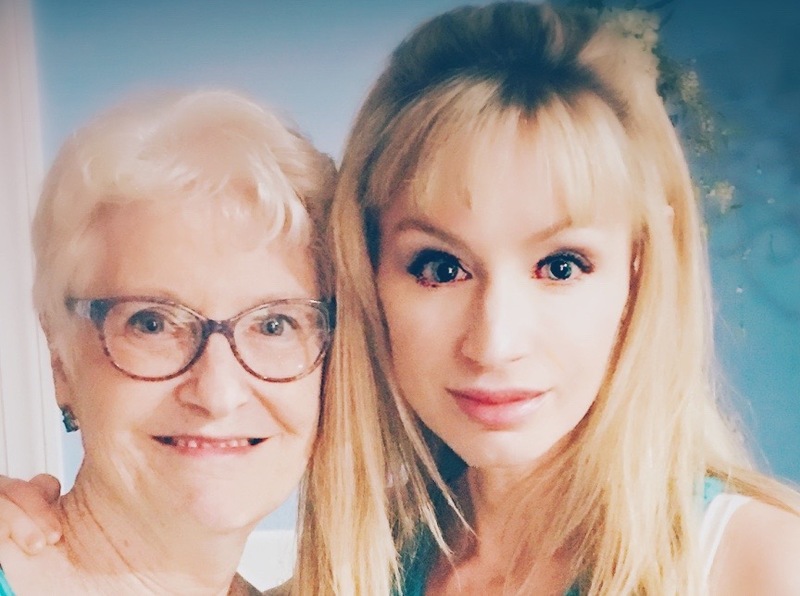 Here’s how I learned to take care of my face – my mom told me how she had acne as a teenager; how awful it was; how she was dragged (kicking and screaming apparently) off to see diabolical dermatologists where she received painful treatments she loathed. She told me she hoped I would avoid this fate and the plague of acne, but Mom never role modeled good skin hygiene. I never observed her washing her face every night. I’ve never caught my mom wearing a sheet mask; never known her to splurge for a facial. I had to figure out the whole skincare thing for myself. It’s like my mother had enough of it as a kid and wanted no part of all that washing and scrubbing, cleaning and clarifying jazz. I’ve always nagged my mother to “at least take off your makeup before bed.” Sometime she would; usually she wouldn’t. We agreed to disagree. My husband is a similar battle. Having also struggled with acne in his teens and endured his own unpleasant interaction with the dermatologic profession, he has no interest in going through a bunch of facial cleansing rituals every night. Each time I rev up to preach to him the importance of washing his face at night, he simply rolls his eyes and walks into another room. Even my baby girl ducks and dodges when I go in to wash her little cheeks and nose. 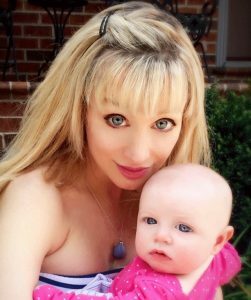 It seems I’m the only one in the house who actually enjoys a good face wash.
Mommy & Me – She may not have taught me to wash my face, but she taught me everything about being a good mother! Another struggle – just about everyone in our household has sensitive skin. My mother has extremely sensitive eyes. My husband and daughter have very reactive skin. So finding a facial cleansing product that won’t irritate has not been easy. I found these highly rated cloths while searching for a potential solution at Paula’s Choice / Beautypedia.com. I almost always agree with reviews of the Beautypedia team, and I highly recommend this website as a resource for anyone looking to save money and make wiser beauty purchases. Seriously, check it out! You’ll be amazed what you can learn about the cosmetics industry and the products you already use or have considered purchasing. Anyway, after checking a couple of drugstores, we located these cloths at a local Wal-Mart and immediately purchased. I was surprised when I opened the packaged because these cloths (unlike the majority of ready-to-use wet cleansing wipes) must be dampened with water to activate. Not a huge deal but it does add an extra step to the process. And it means these are not the wipes you’d keep on your bedside table for a quick swipe before bed, at least not if you expect any results. It is also worth noting that you do have to rinse off the suds that these cloths produce. Again, not a major deal, but it means you’ll need to use these cloths in the bathroom or at least near a sink and/or with a damp wash cloth handy. And that again adds another step to the process which kind of defeats my purpose (e.g. 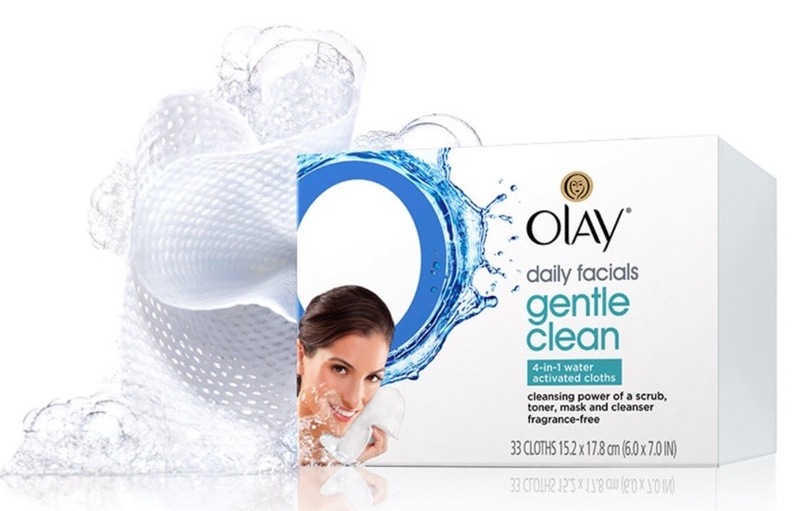 to make face washing as easy as possible for people who openly hate the whole process). I was pleasantly surprised by the size of the cloths. They’re very large, too large in fact to use on my daughter’s tiny baby face. So I cut them into quarters which is easy to do since they come (conveniently) folded that way. Honestly, even my mother and husband can get away with using half a cloth. My mother reported easily removing all her makeup with halved cloths (she uses no eye liner or mascara) and reported no eye burning or sensitivity. Hubs likewise had no complaints or reactions and reported the (halved) size was satisfactory. My daughter never cried or exhibited any problems when we washed her face with the cloths. I always follow up by wiping her face with coconut oil (as I discussed here) which helps keep her skin calm. I found that I only needed half a cloth to remove almost all of my makeup (more on that shortly). And used in this way (i.e. cutting the cloths into halves or quarters), you really get a ton of product for less than $7, which is a great bargain! My one complaint is that it takes a fair bit of scrubbing to remove waterproof eye makeup with these cloths. If you’ve read my eyeliner post (BTW if you haven’t read it yet, you really SHOULD! Check it out here), you already know I’m a huge fan of waterproof eyeliner. In fact, I really only use waterproof eyeliner because I find the regular kind just smudges and runs all over the place. Not only does that annoy me to no end, it wastes my time. And I’d much rather spend my time with my daughter or on more enjoyable activities than fixing messy makeup! I digress, having to scrub too hard around the eyes is NOT good for several reasons. Reason #1 it risks damaging the sensitive eye tissue which has less oil glands and is more vulnerable to stretching and wrinkling than other skin on the face. Check out this article to learn more. Reason #2 is that scrubbing and tugging the delicate eye area can cause loss of eyelashes and eyebrow hairs. This hair loss happens naturally as we age. So the thinner your lashes and brows, the older you appear – not good! Basically this means, if I use these cloths, I have to add a step – eye makeup remover first, then cleansing cloths. Since I purchased this product for others and not myself (I already have a cleansing routine I’m very happy with), this is only a minor strike against the product. I’m deducting 1 star. It may be a fatal flaw for you, especially if you’re seeking a 1-step product to remove your own really stubborn makeup. Summary: These cloths work well for sensitive, reactive skin and are gentle enough to use on baby skin. They are reasonably priced given the amount of product. However, in order to “stretch” the product, you’ll need to invest a few minutes cutting the cloths into halves or quarters (no biggie). These cloths are not wet upon arrival and each cloth must be damped before usage. You will also need to rinse your face after using the cloth, so this is not a one-step face cleansing product. Finally, while the cloths remove most makeup quickly and effectively; waterproof eye makeup is a challenge and requires more effort than you may want to invest when other products remove it more efficiently. I’ve said before and I’ll say it again, you really need to check out Paula’s Choice / Beautypedia. It’s a fantastic resource full of 1000’s of unbiased product reviews, general info articles and the phenomenal cosmetics ingredient dictionary. This entry was posted in Beauty Bargains, Beauty Product Reviews, Blessed Baby, Product Reviews and tagged #beauty, #BEAUTYPRODUCTREVIEWS, #COSMETICS, #FACE, #SKIN, #SKINCARE.